A carbohydrate is an organic compound such as sugars, starches, celluloses and gums, that occurs in living tissues and food. It is important for nutrition since it can be broken down into energy by people or animals. Monosaccharides - These are simple carbohydrates, also called simple sugars, which are made of one sugar. They are broken down quickly by the body and are the building blocks for complex carbohydrates. Disaccharides - These are also simple carbohydrates that consist of two chemically-linked monosaccarides. They come in the form of lactose, maltose and sucrose. Oligosaccharides - These are complex carbohydrates that consist of three to ten sugars. They are rich in vitamins and minerals; and, because they are fiber-rich, they are slower to digest than a simple carbohydrate. Polysaccharides - These are also complex carbohydratges and are rich in vitamins, minerals and fiber; but, they have larger numbers of sugars than an oligosaccharide. Complex carbohydrates are more nutritious than simple carbohydrates. Knowing type type of carbohydrate and the foods that contain that carbohydrate can improve your energy levels and your nutrition. "Examples of Carbohydrates." YourDictionary, n.d. Web. 23 April 2019. <https://examples.yourdictionary.com/examples-of-carbohydrates.html>. A carbohydrate is an organic compound such as sugars, starches, celluloses and gums, that occurs in living tissues and food. 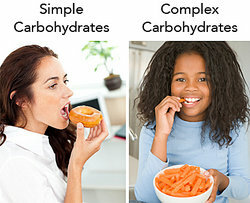 It is important for nutrition since it can be broken down into energy by people or animals.Carbohydrates are divided into four groups:Monosaccharides - These are simple carbohydrates, also called simple sugars, which are made of one sugar. They are broken down quickly by the body and are the building blocks for complex carbohydrates.Disaccharides - These are also simple carbohydrates that consist of two chemically-linked monosaccarides. They come in the form of lactose, maltose and sucrose.Oligosaccharides - These are complex carbohydrates that consist of three to ten sugars. They are rich in vitamins and minerals; and, because they are fiber-rich, they are slower to digest than a simple carbohydrate.Polysaccharides - These are also complex carbohydratges and are rich in vitamins, minerals and fiber; but, they have larger numbers of sugars than an oligosaccharide.